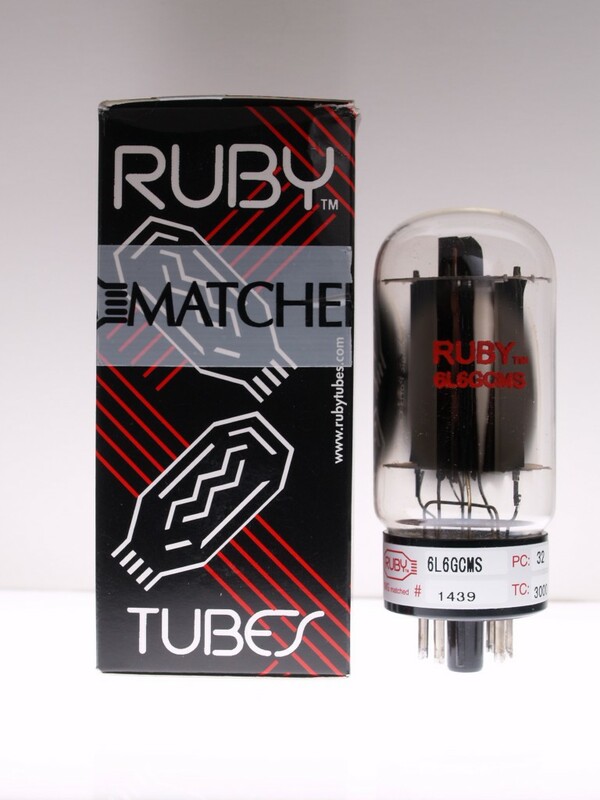 Brand new from Ruby Tubes, this is a black plate short bottle with side getter's and a clear top from the Shuguang factory in China.......so much tight, chimey tone. We like these a TAD better than other short bottle blackplate 6L6GC's out there. I just installed the tubes. The amp seems to have a higher output, the added gain has some background noise when I crank it up. Finally, this amp has some gonads! You helped transform it from a Mesa Nothing to a Mesa Boogie! This amp was too well behaved, thanks for helping me corrupt it, LOL. The tubes are absolutely fantastic! Like others I read in the testimonials with Mesa Express 5:50 amps, I was ready to sell it. The hiss was unbearable and the tones across the channels were a mess. The new tubes cleaned all that up and I'm loving the amp again. Thanks again and when I get ready to retube the Twin I'll send in another order. Amp is a Vibrolux Reverb, single coils on the guitars. Previously running a nice matched set from Doug that had loads of clean headroom but most of us can't turn our amps up to take advantage of where the output stage of a Fender really starts to live & work hard. Doug suggested these, specifying early distortion. No issues in biasing from the previous tubes, small turn on the bias pot. For those who haven't tried them it doesn't take your sound & turn it into a fuzzbox. But the tubes do start to "bloom" earlier on the dial. They are very full throughout the sonic range and actually more trad "Fendery" than my old ones (which I'll keep if I ever need the occasion to turn up to 7). Great recommendation. I have owned skunks to classic great sounding NOS and these are at the top soundwise not to mention the price! What sort of hours playing time longevity can I expect? I think these are running a bit conservative as the amp is designed for 6V6 or 6L6 and I am running a 5u4.